Leigh Ann DeLyser facilitating our CS for All SCRIPT workshop. Public education in the United States changed slowly. Even when students, parents, and the public want it to change. This historical reality is a big barrier to audacious goals like CS for All, which are trying to transform national curriculum and teaching, and do it to meet demand. In Washington state, for example, almost 90% of voters and parents want their children to learn about computer science in public schools, and yet less than 1% percent of students in our state learn it. And it’s even harder in a state (and country) where decisions around what and how CS might be taught is radically decentralized: states, districts, schools, and their principals are the ones making these decisions, not state or federal government. In a decentralized environment, making such change requires very different strategies. It’s much more about persuasion, coalition building, and community organizing than it is about just carefully designing policy (though careful policy design is also necessary in a decentralized environment). But even more so, it requires more than just a vision and a great leader, but many different visions and many great leaders, since each school and each district needs its own passionate change makers to make anything happen in a way that is appropriate for their local politics and values. Where are all of those leaders going to come from? And what skills do they need? As a state leader trying to organize and accelerate Washington state’s CS for All efforts, these are the big questions that keep me up at night. One of the amazing things the national CS for All consortium has done is not answer these questions, but also provide workshops to teach these answers to change makers across a state. Leigh Ann DeLyser for CS for All, and visitor Mike Karlin from Indiana who has done many of these workshops, came to Bellevue, Washington to facilitate a workshop for Washington state, to help us catalyze change. 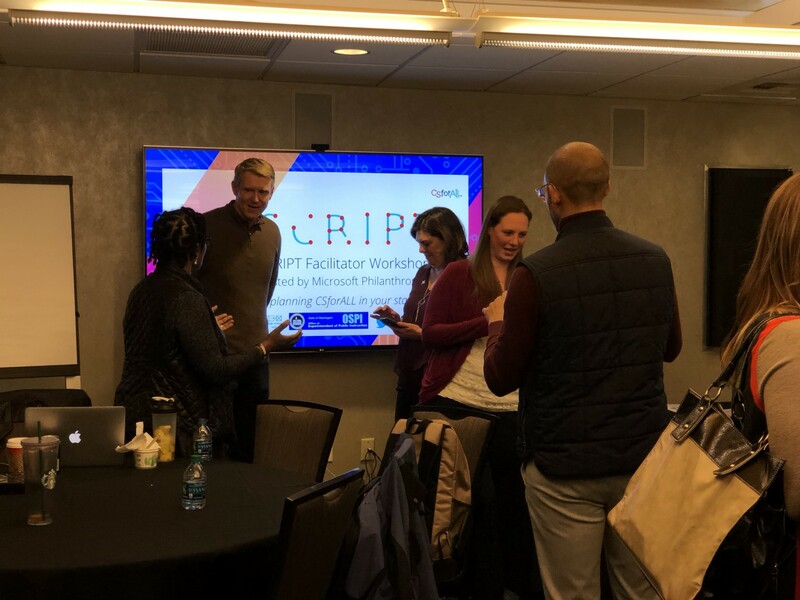 Amazingly, our CS supervisor in our Office of the Superintendent of Public Instruction, Shannon Thissen, managed to recruit leaders at from all of our Educational Service Districts (ESDs). The goal was to prepare every one of these leaders to become local advocates for the 98 schools districts across the state, helping organize their efforts. And most importantly, it positioned each of these facilitators to speak directly to district superintendents, school principals, and teachers, as all of them are key to implementing CS for All. Principals in particular are important, as some data shows that about a third view CS as some optional, supplementary enrichment that’s only nice to have. That’s a big administrative barrier to change. The workshop, which CS for All has called SCRIPT (School CSForAll Resource and Implementation Planning Tool) was framed as a form of professional development for change facilitators. 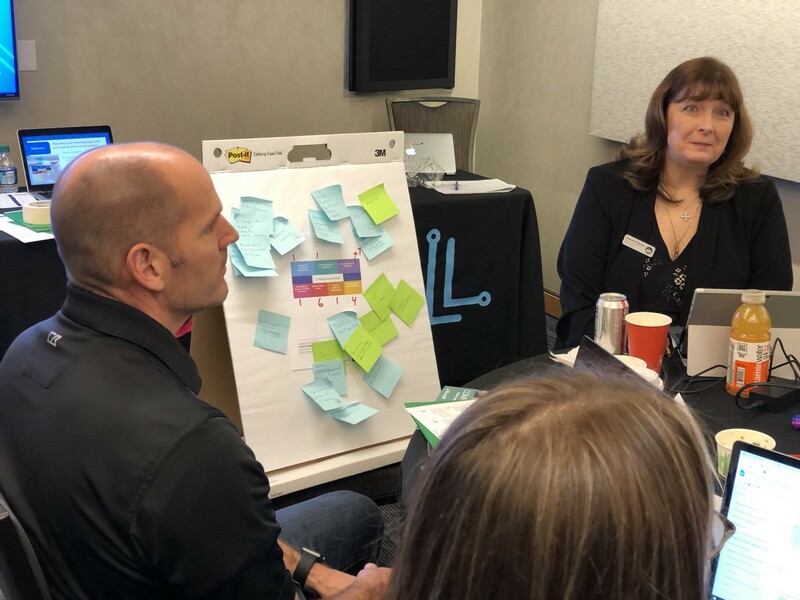 The goal was to help facilitators learn how to run workshops with one or more districts, but also help facilitators become effective community organizers for these districts. The underlying principle is that, because of decentralization, each district really needs to bring its own local constraints and values to planning. Achieving all that in one day is pretty though, but many of the ESD facilitators already do this kind of work for other subjects like math and science, so the workshop was free to focus a bit on CS in particular. 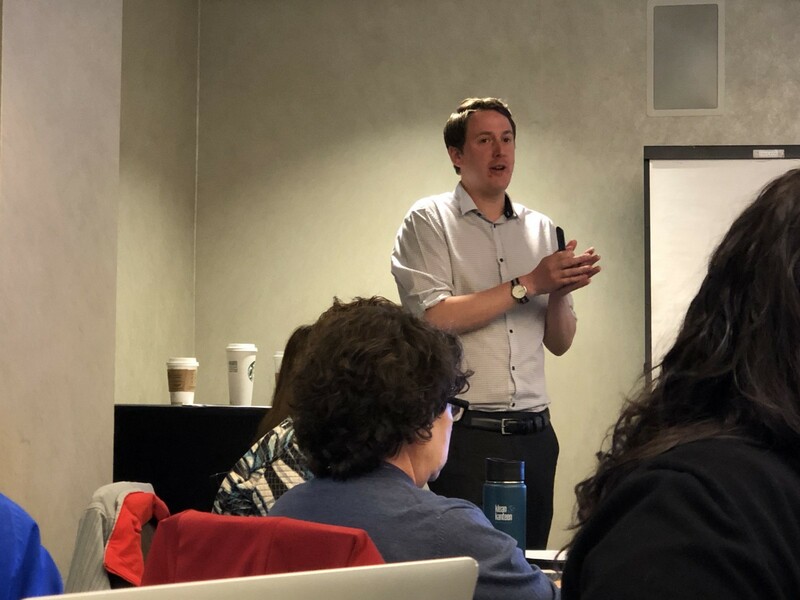 I learned a lot in the workshop about community organizing, about my state’s capacity for change, and about some of the resources our CS for All Washington team will need to prepare everyone for change. Below I try to share some of the critical ideas I learned. There’s so much a district might already be doing around CS and so much it could be doing. But no district can do it all, especially not all at once. Shared visions can be a powerful way to focus efforts and set short, medium, and long term goals to achieve it. Just as important is who sets the vision. The workshop prepared facilitators to recruit representatives of every stakeholder in a district, then use the workshop time to develop a shared vision together, as well as identify shared goals to achieve it, and identify people who are responsible for those goals. Another critical part of setting a vision is surfacing rationales for teaching CS. Different stakeholders may have many different goals, and before a district can set a vision, it needs some clarity on why everyone would be doing this work. One clever approach to this is to give districts a sheet of paper that has a whole set of common rationales for teaching CS and have them select the ones they value the most. This prevents them from focusing on reasons not to teach CS, but also streamlines brainstorming. One barrier to persuading district leaders to teach CS is that they don’t know what teach CS is. The SCRIPT facilitators argued that most of district planning really isn’t CS-specific; all that’s necessary is a bit of exposure to the content, and then the rest of the work is more conventional strategic planning. 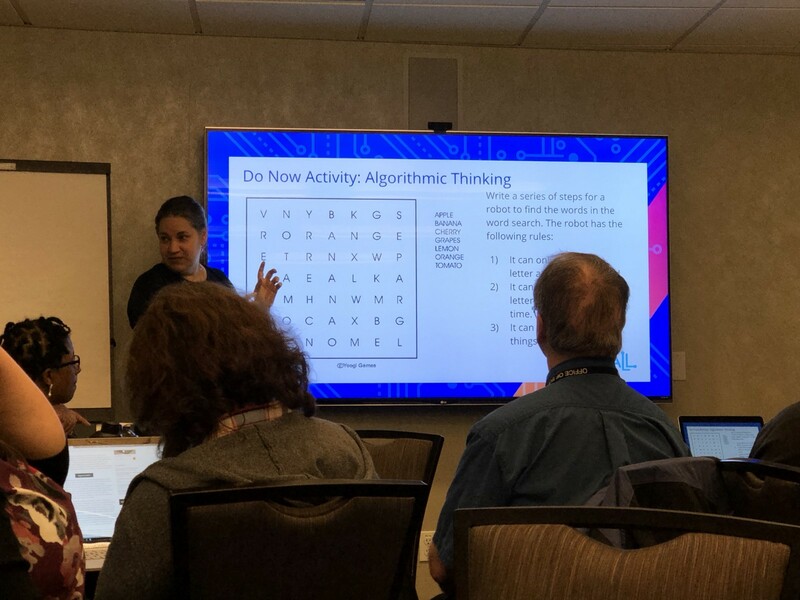 The facilitators recommended the task in the photo above, in which participants devise an algorithm for solving a word search puzzle algorithmically. I was surprised by how well this activity demonstrated 1) the lack of need for computers, 2) the fact that many people already have basic skills in thinking algorithmically, 3) the active learning pedagogues that CS often engages, 4) the role of abstraction in expressing general solutions, 5) that computing isn’t just about programming or computers, and 6) some of the challenges in teaching to this activity, motivating the need for teacher education. It only took about 10–15 minutes to surface all of this, and then the rest of the workshops can be focused on strategic planning. Once districts have a vision, a key next step is helping them identify short, medium, and long term goals to achieve. 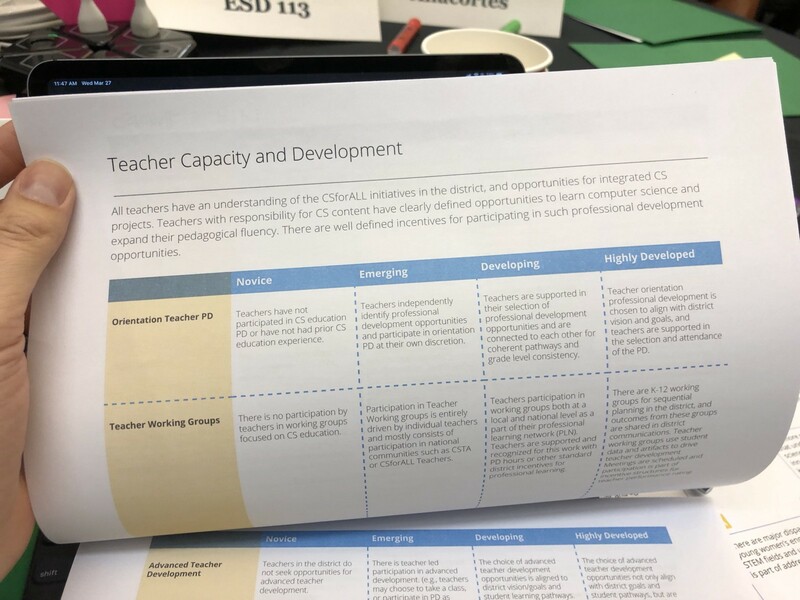 However, many leaders are quick to jump to solutions, so the SCRIPT organizers recommended instead using a set of rubrics they’d developed to help districts self-assess their maturity at various aspects of CS teaching support, including teacher capacity, community, partnerships, and leadership. The rubrics do a great job of both helping a district understand where they are now, but also giving them lots of ideas for potential next goals that could help them get to a higher level of maturity. Participants who’s conversations are about to be interrupted. All of the activities in the workshop reveal an endless amount of work to do. And this shouldn’t be surprising: change of any kind requires a lot of thought and planning. However, a one or two day workshop isn’t enough time to do all of that work, and so the organizers recommended actually cutting off conversations at the height of engagement. This has a couple of desirable effects: 1) it shows just how much more talking there is to do, and 2) it makes participants want to finish those conversations, motivating them to meet later to have them. In all of these activities, the organizers recommended framing every discussion in the context of a marathon metaphor. Policy takes years to implement, teachers take years to train, sustainable infrastructure in a district takes decades to create. The more that all district leaders can think of their vision in terms of decades, and their goals in terms of months and years, the more realistic and feasible their work becomes. This is hard for a lot of people because they want to implement things now, but change can be exhausting. Slowing everyone down prevents burnout and unrealistic expectations. Because of this long cycle for change, another key strategy for the workshops and beyond was to identify concrete action items and owners for those action items. Today’s workshop didn’t talk much about the project management that’s required to get people to follow through on those action items, but in my experience, there needs to be someone who’s really tracking all of these things (at the state level, I have a big Trello board of priorities, which my state leadership team reviews monthly). 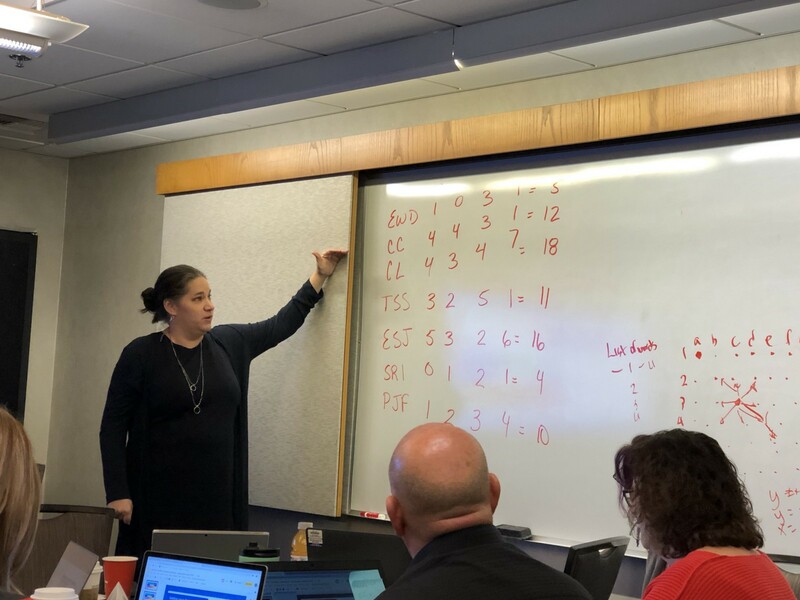 Leigh Ann discusses how to use data about each participants’ interest in teaching CS to understand a districts’ diverse values. We spent quite a bit of time in the training practicing how to pitch and frame each part of the workshop, to ensure each district leader would be fully engaged and make the most of their time. The organizers argued that this really requires understanding each of our local audiences exceptionally well, and connecting to their experiences. For example, one ESD facilitator thought of the idea of connecting to recent strategic planning failures, such as “Remember a few years ago when we dropped Common Core on you and didn’t provide support? This exercise is going to help us prevent that problem.” Others preferred to retsate the visions that districts had formed, connecting each of these goal setting areas to the vision. A lot of the ideas in the workshop aren’t really specific to CS. And this isn’t surprising: much of the content of the SCRIPT facilitator training and the workshops that facilitators run is based on research about transformational change in education. What CS for All has done (and what I summarized above) is manifested a lot of the basic principles of organizational change into a polished model for streamlining change in U.S. public schools. 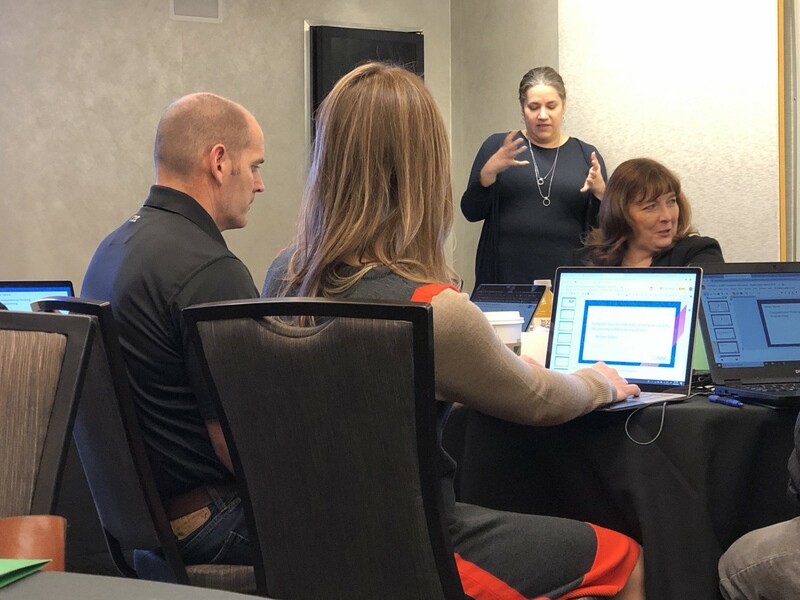 I left really impressed by CS for All’s work, confident that many of the ESD facilitators in my state would be empowered to catalyze change in their districts, and motivated to create the state level resources they need to do this work.